A team of physicists based in the UK, Germany, New Zealand and Canada have described a new technique which could overcome current difficulties with using twisted light data transmissions across open spaces. So called twisted light adds extra data to photons by passing them through a hologram and has been previously demonstrated as a method to boost data transfer over optical cables. However, air transmission has been more challenging as “even simple changes in atmospheric pressures across open spaces can scatter light beams and cause the spin information to be lost,” explains the University of Glasgow news blog. In particular the scientists have been testing optical angular momentum (OAM) techniques with varying phase and intensity. The team chose a ‘real-urban environment’ passing 1.6km over fields and streets and nearby high-rise buildings in Erlangen, Germany. The free space link tests in an area with interference from such factors as turbulent air highlighted the fragility of shaped phase fronts, particularly for those that would be integral to high-bandwidth data transfers. 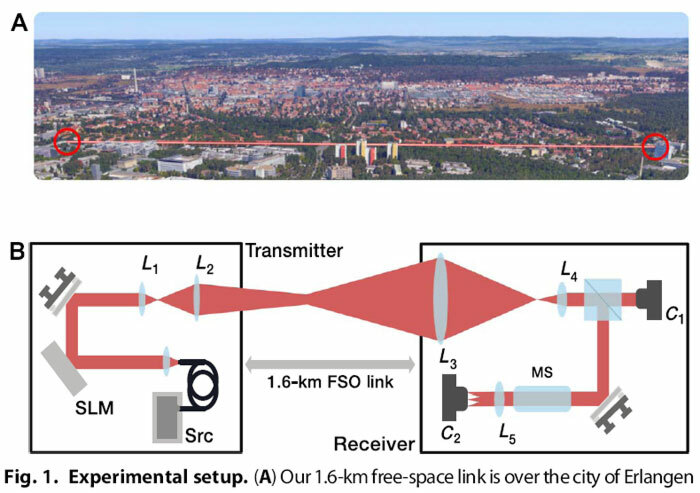 From the tests the scientists are now confident that they can adapt the transmissions with channel modelling, adaptive optics, or precorrection techniques to overcome the real world urban point-to-point transmission challenges. 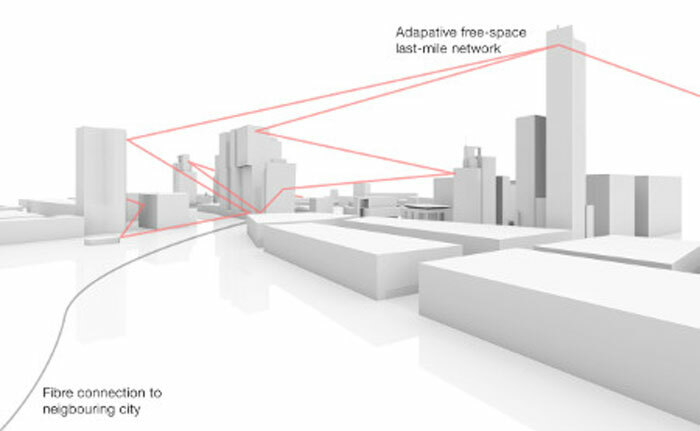 In the diagram above you can see how the scientists wish their inner city networking plans to pan out; with optical fibre connections between cities and adaptive free-space transmissions over the last mile. Interesting artice, but I wonder what happens in fog, heavy rain or snow? Probably the same that happens to mobile signals in the same conditions. The signal quality deteriorates. The Pigeon-Crow alliance might have something to say about all of this.